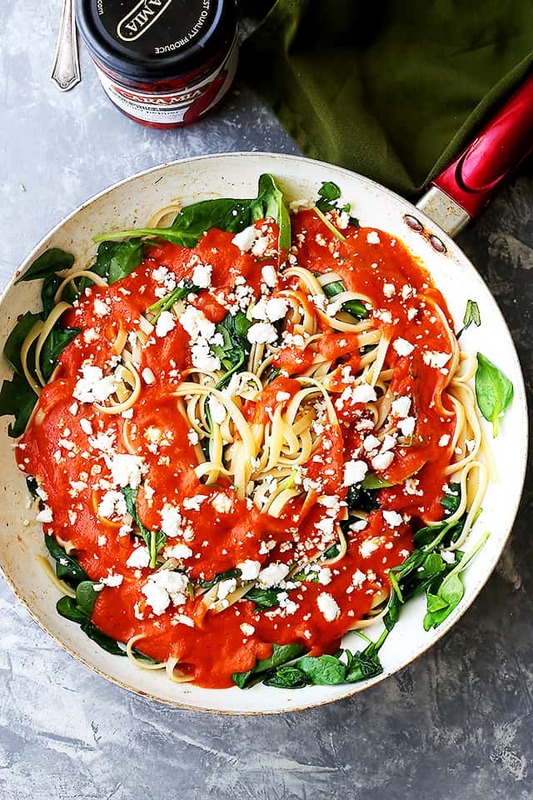 Red Pepper Sauce Pasta with Spinach and Feta – A perfect weeknight meal featuring sweet red peppers blended into a delicious and healthy sauce tossed with fettuccine pasta, spinach and feta cheese. 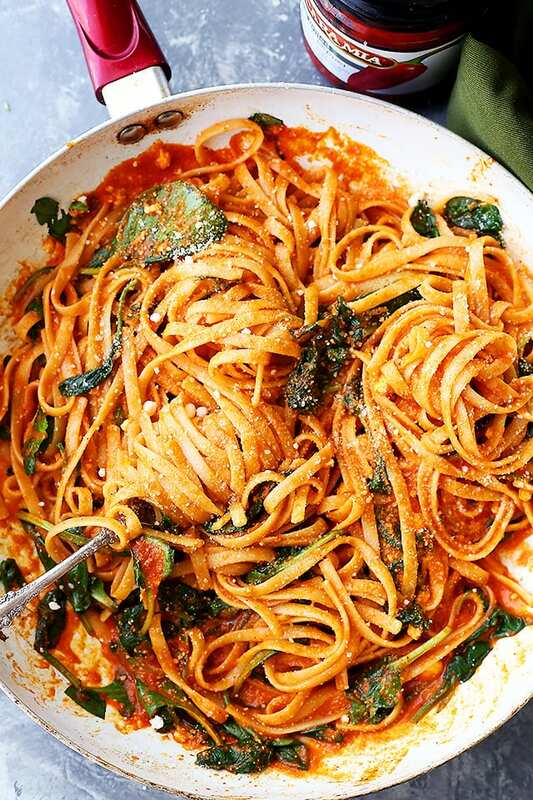 Red Pepper Sauce Pasta with a creamy, savory-sweet red pepper sauce, spinach, and feta cheese. Light, healthy, and simple, yet so, so good and delicious! Red Peppers + Spinach + Sheep’s Milk White Cheese (Feta) = The flavors of my lovely Macedonia blended into ONE! Hey Ya! Happy Cyber Monday! Are you shopping, yet? Finding any deals? If you’ve found some killer deals online, please let me know! Tag me on social media, leave a comment, send an email! Especially if it’s 99% less than retail price. Those are the kind of deals I’m looking for. Wanna know how serious I am about Holiday shopping? Not.at.all. I spent my Black Friday on the couch and not at the stores. They better be giving away things for FREE if they want me to fight those crowds, know whaddamean? Shoot. Watching a Real Housewives marathon was my Black Friday celebration, and I’m good with that. This post is sponsored by Cara Mia Products! All opinions are always 100% my own. 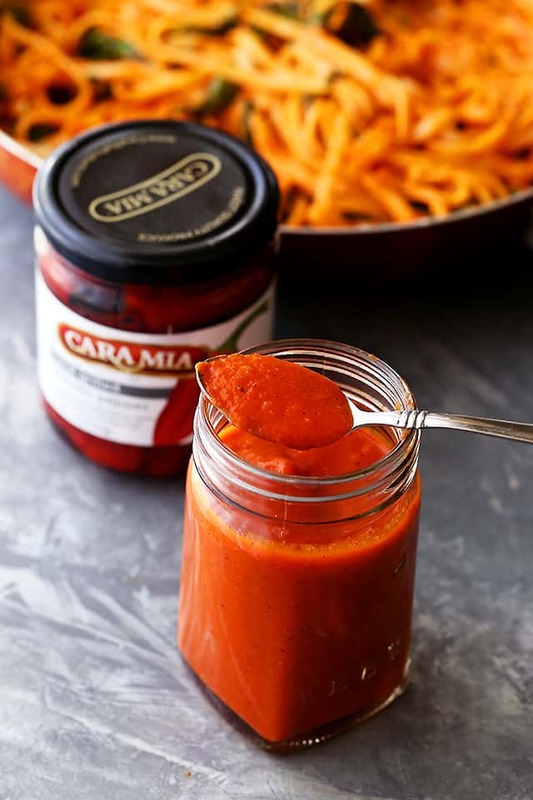 Later that day, because I was dying for a taste of Cara Mia’s Hand Grilled Piquillo Peppers, I made a meal out of ’em by throwing them in the blender and making us this silky and flavorful Red Pepper Sauce. These peppers are hand grilled and have a smokey, distinct taste. Paired with garlic, onions and some herbs, they also make a pretty amazing pasta sauce. On a scale of WHOA! to WHOOOOOOA!, this pasta dish was WHOOOOOOOOOOOA! Creamy, peppery, garlicky, cheesy…goodness. I can still taste it. It left us speechless. Not because we didn’t have anything to say – oh no, we ALWAYS talk – but because we didn’t want to come up for air. As always, I think it would be a great idea for you to go and make this as soon as possible. 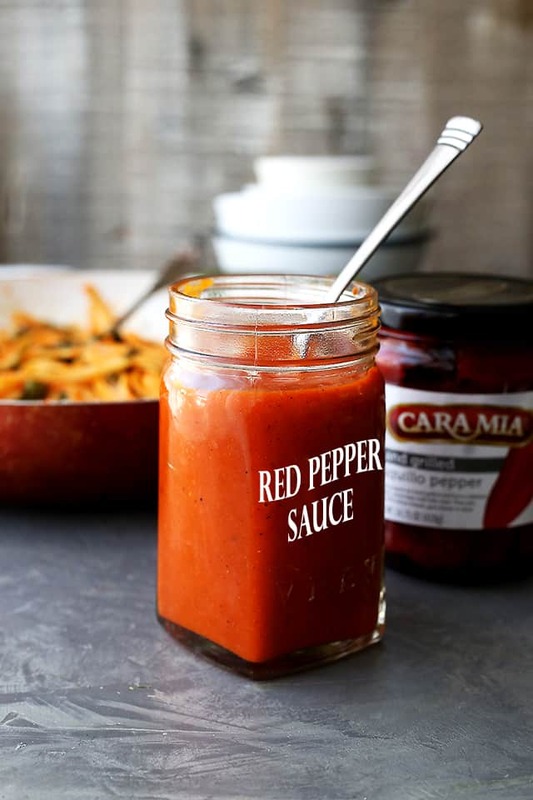 Or as soon as you get your hands on a jar of Cara Mia Hand Grilled Piquillo Peppers. The whole dish comes together in no time, to be quite honest. 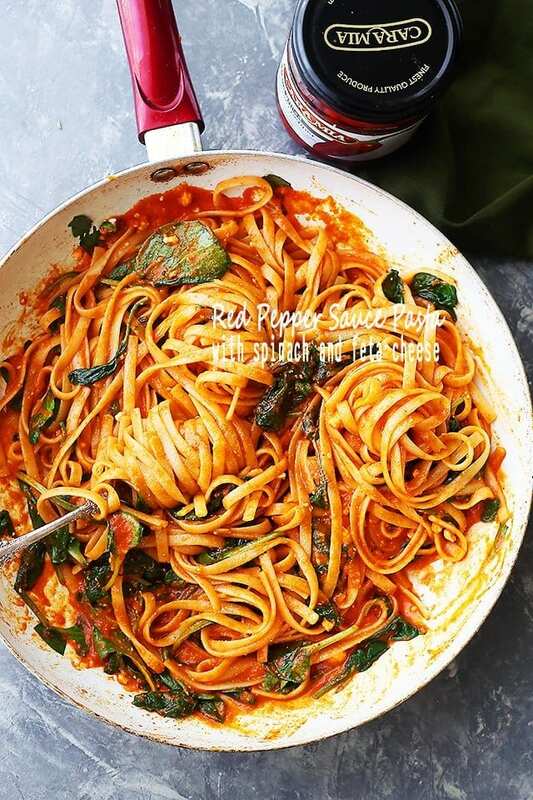 While the pasta is cooking, you’ll grab your peppers, STAR Extra Virgin Olive Oil, some sauteed onions, garlic and seasonings, throw ’em in the blender, make the red pepper sauce, and then wait to just toss it all together with the cooked pasta, spinach and feta cheese. 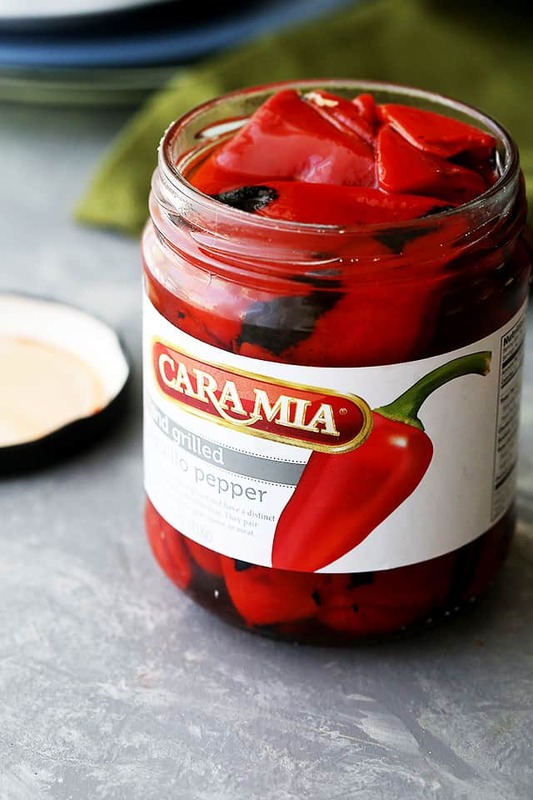 CARA MIA Piquillo Peppers are available at select Safeway, Vons, Schnucks and Dierbergs stores in the produce section and online at STAR Fine Foods. 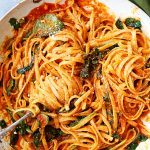 Red Pepper Sauce Pasta with Spinach and Feta - A perfect weeknight meal featuring sweet red peppers blended into a delicious and healthy sauce tossed with fettuccine pasta, spinach and feta cheese. Place drained piquillo peppers in a blender and set aside. Heat 2 tablespoons extra virgin olive oil in a nonstick skillet. Add sliced onions, garlic, thyme, salt and ground pepper; cook for 4 minutes, stirring frequently, until tender. Remove from heat and transfer the onion mixture to the blender. Add water and blend until completely smooth. If too thick, add a tablespoon or two of extra virgin olive oil or water and continue to blend until desired consistency is reached. Heat remaining extra virgin olive oil in a skillet. Add spinach and cook for 2 minutes, or until wilted. Drain pasta and add to skillet with spinach; stir in feta cheese and add as much pepper sauce as you prefer and toss around to combine. This is totally my kind of recipe. That sauce pasta looks delicious. Some to treat for sure very soon. LOL, I think I spent part of my Black Friday on the couch too. This pasta looks super yummy! What a great looking dinner! Love it! I know what I will be making when we want pasta next time! This looks amazing! Now I am craving pasta for breakfast, although I could eat it all day long!